Samsung may have patented a folding phone, but Lenovo is ready to show off one that not only bends, but also folds around your wrist like a wearable. 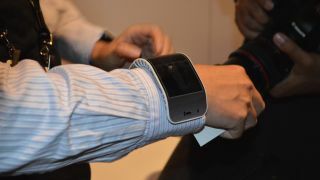 Unearthed at the company's Tech World conference Thursday, the Cplus is a phone that literally folds around your wrist. Call it a phone cuff, if you will. The Cplus features a 4.26-inch display that contours around your arm. There's a cracking effect (and sound) as the Android phone's screen bends, though no damage is incurred on the device. Unfolded, the Cplus is a very skinny phone that looks like a digital slap bracelet. The Cplus was first revealed during the Tech World conference's keynote. While bulkier than pretty much every wearable currently on the market, the Cplus does let you enjoy the convenience of a display on your wrist without needing a phone to accompany it. Because, well, it is the phone. We also saw Lenovo's Folio tablet concept, a slate that folds in half to the size of a paperback. It, too, had the cracking effect of the Cplus - it's a little unsettling to witness the tablet fold in two, but no less impressive. During the keynote, a Cplus-wearing Meghan McCarthy held the Folio up to her ear and said she could make phone calls on the tablet. While we haven't heard from Lenovo whether it has calling capabilities, there's a chance this is a tablet that can literally fold into a phone. While definitely still in the concept stage, these devices show where Lenovo is headed: the company wants hinges to disappear, according to Lenovo CTO Peter Hortensius. Hortensius said much goes into making a bendable device besides a flexible display. Other parts, such the battery and motherboard, need to fold, too. The device also has to return to its original shape when it's unfolded, another challenge met by the Cplus and Folio. Both the Cplus and Folio are firmly in the concept stage right now, but look for Lenovo's foldable tech to show up at some point down the line.